Current and former military men can tell you about how fast a hair clipper can work. If you have ever watched clippers in action on military personnel, you have probably seen a head completely shaved in a matter of minutes. Electric hair clippers were first designed to get hair off of your head quickly. As time went on, clipper guards and advanced clipper designs allowed for modification of haircuts that went beyond the standard buzzcut. Nowadays beauty salons and barber shops tend to keep hair clippers as part of their normal styling tools. The main component of a hair clipper is the motor design. 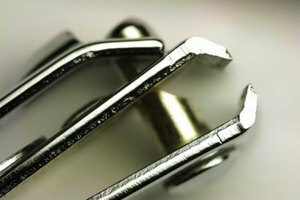 Attached to the motor is a piston that holds a set of small, sharpened blades shaped like a comb full of teeth. When the motor is powered by electricity or a battery, it moves rapidly in a horizontal fashion. There is also a slight vertical axis movement. These movements cause the blades to rub against each other at a speed that allows it to cut hair. Since the blades are self-sharpening, they cut hair without pulling the entire follicles out of the scalp. Electric clippers require little maintenance beyond brushing hairs out of the blades and applying one or two drops of lubricating oil during every other cut. The motor is housed inside a plastic case that is usually designed for handheld use. 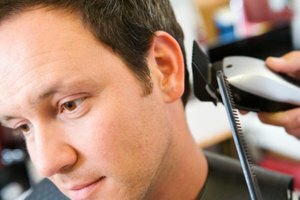 A barber typically runs the blade perpendicular to the scalp with a scooping motion at the end. Most modern hair clippers that are designed for styling come with several clipper "guards." The guards are attached atop the blades. Depending on the guard size, they evenly cover some teeth on the blades to achieve a desired cutting length. For example, a one-half inch guard will alternately cover enough teeth to cut the hair to a half-inch length for each follicle. 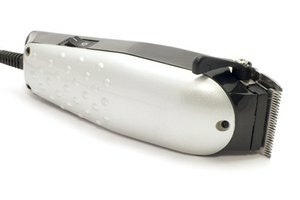 Some clippers also have an adjustable lever on the blade itself to manage hair length differentials as little as 1/32 of an inch. This function is beneficial when cutting a "fade". Fade haircuts show a gradual taper of hair length on the sides of the head from an unlimited hair length at the top to almost bare skin on the sides.